Every document in a collection of similar PDF files contains an area with a text that should be searched. The goal is to detect, whether the area lying at the bottom right corner of the page contains specified text. iText library provides a few classes suitable for text extraction. For example SimpleTextExtractionStrategy, LocationTextExtractionStrategy or PdfTextExtractor. Unfortunately none of these allows to specify an area where the text should be searched for. These classes usually return all texts on a page mixed together into one big string. This can be overcome by implementing RenderListener interface to collect texts from specific area of a PDF page. The listener then can be passed into iText document parser's content processor that goes through all text objects on a page. 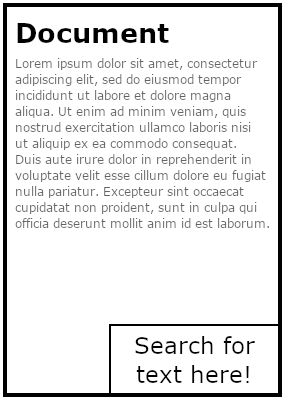 // Collect all texts in a box at the bottom right corner of the page. // The bottom left corner of the page is page's origin (0, 0). The collector should be then called for every page of a PDF document.